"This is a tasty, thrifty comfort food which is healthy and can be changed to fit any lifestyle. Add some cheese or bacon bits for a different twist." Place new potatoes in a shallow roasting pan; drizzle with 2 tablespoons of olive oil. Roast for 15 minutes, turning once. Add portobello mushrooms, placing stem sides up, and garlic cloves to pan. Sprinkle with chopped thyme. Drizzle with 1 tablespoon olive oil and season with kosher salt and black pepper. Return to oven; cook 5 minutes. Remove pan from oven and add cherry tomatoes. Return to oven; cook until mushrooms are softened, about 5 more minutes. 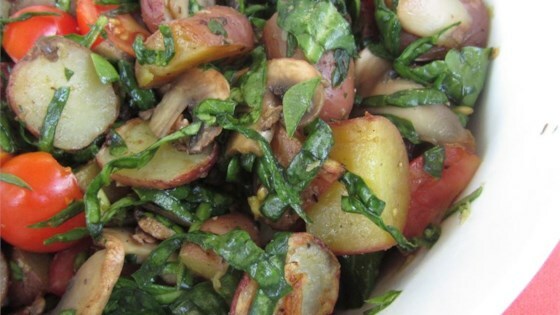 Scatter pine nuts over potatoes and mushrooms. Serve with sliced spinach. This was absolutely delicious, I couldn't stop eating it! I like to add cut up sausage to it as well, it makes an easy one dish meal. I added a sliced onion, but the recipe was really nothing special. I will not make it again. I added the spinach with the tomatoes to wilt it a bit. Everything came out wonderful. I'm enjoying it tonight with a freshly roasted chicken. Yummy! Great side dish, happy with results overall. Next time I'll make a few changes though: cut potatoes smaller or pre-cook; add more mushrooms and a small onion; reduce the spinach a bit. Great and fairly simple recipe! My family loved it! I'd cook the potatoes a little longer though and use more mushrooms and tomatoes next time.